Get ready for a grand display. 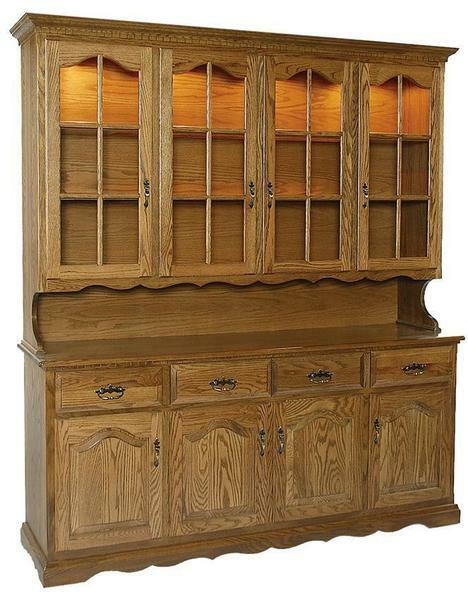 The Amish 74" Four Door Dining Hutch with Opening is sure to make an impressive host in the dining room or kitchen. Carefully planned shelving and cabinetry are produced by knowledgeable Amish woodworkers who build high function into every gorgeous piece of Amish furniture they make. There's so much you can do to put your signature on this dining hutch. Custom options are aplenty with everything from premium wood types to base styles to the addition of glass shelves with plate grooves and touch lighting. Or maybe you prefer all wood shelves for books or rows of prized tea cups. Measures 74" wide, 20" deep and 84" high with a buffet height of 33"
Get in touch with answers to your questions via email or phone. Our Furniture Specialists are at your service with help on wood type suggestions, shipping information and much more. We are happy to offer payment plans requiring only 30% down. Email us at Questions@DutchCrafters.com or call toll-free at 866-272-6773. Thank you for shopping with DutchCrafters.